All of these things contribute to me coming across as totally different to the person whom I really am. I appear to be stand-offish, arrogant, rude and possibly even (ever-so slightly) narcissistic. Once I get to know someone I can begin to relax. Relaxation takes the edge off me and I can become the quiet, sarcastic, perfectionist with a very dry sense of humour and a need to please everybody … the Real Me. We had a new colleague start at work in September. She’s younger than me, and in a more senior position than all but one other member of staff. She’s my Line Manager and I work for/with her within many of the variances of my position. I thought I would get to like her. I thought we would get on. There aren’t many people I don’t get on with, especially amongst those whom I see on a regular (daily) basis. But I don’t seem to be able to relax in her presence. I think the problem is that she’s very wishy-washy. Then there’s the fact that I know one of her particular roles far better than she does, and can contribute more effectively to it. Oh, and she treats me like a Teaching Assistant. Tsk. I know I’m only a Teaching Assistant, but I’m a Teaching Assistant with Brains and Common Sense, thanking you muchly. I don’t need someone to hold my hand or guide me through doing something that I know how to do (and better than she does). Last Tuesday I started to like her. We had an appraisal type meeting and it was … nice. Yes, nice. Even if she did ask me pointless questions which served only to reveal her ignorance of me and the job and the place where we work. Later that day she came and asked me if I would mind moving back to the building I worked in last year. The new teacher isn’t getting on very well and needs to move to the main building. I could barely disguise my joy! I so desperately want to move away from (her) the main building and melt back into the bosom of my family (the teachers I worked closely with last year), where I belong. And now that I won’t have to see her everyday there’s the very real possibility that we might actually become friends. If we become friends, or at the very least more friendly, then I can relax. If I start to relax I’ll start to enjoy my job again. See? There might be a God after all. And S/He/It might even be on my side. Spending copious amounts of time online is like getting inebriated. When folk spend too long browsing the Internet they begin to lose their inhibitions. As they lose their inhibitions they start to spout nonsensical things that they wouldn’t dream of spouting in their (sober) Real Life. Some of those things are sweet (the “I loves yous, I do,”) but sometimes those things are terrible. Hiding anonymously behind a computer monitor maketh Mr. Ordinary a brave man indeed. Put Mr. Ordinary together with Mr. Average and a Daily Mail website, and you can create an Internet forum that relishes hate. It could be your neighbour, your colleague or even your friend. The above video was made to highlight the way that us Brits apparently perceive teenagers. It is inspired not only on attitudes expressed on Internet forums, but also a YouGov poll commissioned by the charity. To be honest, I’m not sure whether to laugh or cry. The YouGov poll was one that I remember completing myself. It didn’t give much scope in the way of answers and so the results are negligible, especially when you throw into the mix the fact that only 2000 adults responded to it. How they can assume that 1000 adults responding to a survey which has ridiculously phrased questions – with ridiculously worded answers – can speak for half the adult population of Britain, I have no idea. However, I’m unsure as to where my thoughts lay in relation to the whole ‘demonisation’ debate that has cropped up. As someone who works with the sort of teenagers you would cross the road to avoid I can understand why adults might have such a low opinion of them. And to an extent I actually agree that they do appear to be more feral and more violent than in previous generations. But, I know that they’re (mainly) harmless. And me knowing that doesn’t take away the fear that the elderly, or the vulnerable, or even Mr. Ordinary feel when they see teenagers who they assume might be causing trouble. I could give you stories that would fuel the debate. I could tell you about Master Nice Guy who was in court today for assault, or Master Chav Jeans who nearly beat up his (ex-)friend for matters best dealt with by the authorities, or Master Did He Do It? who could be in serious trouble with the police. But I could also show you three scared young men who live pitiful lives, watching siblings being abused and drug-addict parents murdered. Those things don’t excuse the behaviour of teenagers we see on the streets, but they are reasons why some teenagers on the streets may act big and tough. I’ve known the ‘hardest’ of fifteen year old boys to cry because they don’t know if they’re going to wake up in the morning to find their dad dead in bed due to an overdose. Kids are kids. There is nothing really terrible about (most of) them. I don’t know what the answer is. Perhaps if we stop force-feeding them the National Curriculum, or stop making league tables more important than their welfare, or offer them places to hang around and things to do. Maybe if we give them the opportunities to better themselves. Or, perhaps we just need to listen to them, talk to them, recognise that for the most part they are vulnerable young people who really crave attention and just want people to like them … they’re not demons. They’re children. There are a few things that myself and The Blokey disagree on. We bicker about how dead a language Welsh is, and I tend to bite my tongue when he spends oodles of money on eBay buying a second-hand thingy for the car, and yet moans about spending £20 over-the-odds for tickets to see a band I couldn’t possibly die without seeing. We also disagree on the usefulness of the Royal Family. I like having a Royal Family. Despite the fact that they’re not thoroughbred English folk (let alone Scottish, Welsh or even a little bit Irish) I love them. I do. I am proud to admit that. Don’t misread this. It doesn’t mean that I agree with some of the things they do (namely hunting) but I can forgive them their indiscretions because they belong to another world. The world they belong to is rich and frivolous, full of Champagne glasses and yachts and posh frocks. They don’t know what it means to have to scrimp and save in order to pay the gas bill or buy that new PS3 game. I do stand by the belief that to rid this country of the Royal Family would be scandalous. They are our history and they should be our future [I sound like a song], although perhaps slightly less idolised and slightly more down to earth than they currently are. 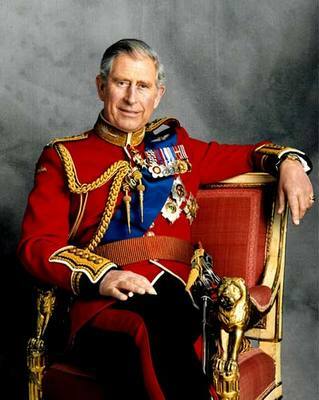 And thus, I would like to take this opportunity to wish Prince Charles a very happy sixtieth birthday. I hope he got some lovely presents. 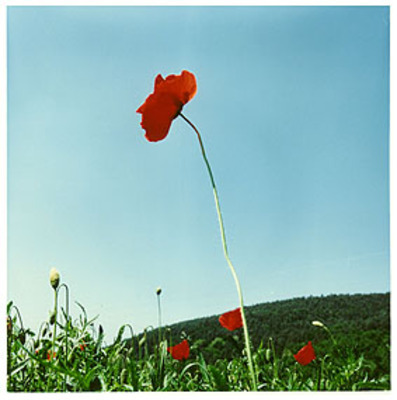 I haven’t worn, nor bought, a poppy since my early teens. At first it was probably due to teenage-angst; a rebellion against those who might have wanted me to conform to normality. Gradually it became twisted in my head until I truly believed that I didn’t want to buy a poppy, nor wear one with pride, because it would somehow be disrespectful to my grandad. He never (or rarely) spoke about his experiences in WWII. In my naïvety I used this as my excuse … how could I even contemplate wearing a poppy, and thus join in with Remembrance Day, if my grandad didn’t even want to remember those terrible years himself? This is a picture of my grandad before WWII broke out and turned his life upside down and inside out. The woman on the left is my nana. 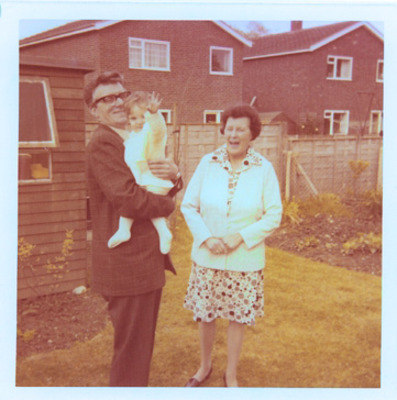 When the war began my grandad was twenty-nine years old and worked for British Rail. He and a friend went and offered their services signed up immediately, but he didn’t actually go to war until 1942. By this time he had married my nana (June 1940) and become a father to Mumsy (March 1942). He was an Eighth Army Royal Engineer and the war took him to the Middle East and North Africa regions. He was (probably) involved in battles in Egypt, Palestine and possibly Italy. He came home with a couple of medals and a mention in Despatches, although we’re not sure what for. But he never (rarely) spoke about his experiences. He didn’t broach the subject at all with my nana until fifteen years after the war ended, and even then what he spoke about was brief. In his later years he was more open, but even then what he spoke of just skimmed the surface. If I try to think about the whirlwind of emotions that he must have gone through my heart just wants to explode with the pain of it all. And of course, these are all the reasons that I should wear a poppy. I should wear one for all the men who were like him; ordinary men who were prepared to leave their families and fight for the continued freedom of their country. Ordinary men like The Blokey, and The Baby Brother, and the random men I see on the streets … men like you. I should wear a poppy for the women like my nana; ordinary women who waved their men-folk off to war and tried to live as normal an existence as possible under the circumstances, never knowing if and when they would see their loved ones again. Ordinary women like me, and my friends … women like you. So I promise that next year I will buy a poppy and I’ll wear it with a mixture of both pride and sorrow. Is it nearly over yet? Have you almost decided the fate of the rest of the world? Oooh, did I tell you? We once had a young photogenic orator running for President Prime Minister. That turned out well. Perhaps you’ll have better luck with yours, if he wins. Best of British, eh? Let’s hope the Best Right Man finds himself successful, for our sake as well as yours. A genuinely curious PS: Do you think all the money that was spent on the Presidential Campaign could have been put to better use, perhaps on – oh, I don’t know – something important … ? As a paranoid social-phobe it’s fairly safe to say that today is a day I can do without. I shall get home from the hospital at some stupid hour and go straight to bed. I shan’t even bother to turn the lights on. This could make feeding the cat an interesting experience. We don’t normally have any problems on Hallowe’en in FlatHickTown, but there’s always a first time. And the car isn’t on the drive (it hasn’t gone missing; it’s on the road! Is that your car? It’s well cool! said the Sky+ HD installer on Wednesday,) which worries me too. We should have been travelling to York today, for our belated anniversary weekend. The next two nights should have been spent frolicking on a posh bed in a posh hotel. Instead, The Blokey is stuck on a plastic mattress surrounded by old men who strip naked and call me ‘nurse’. Tabatha has gone doolally. When The Blokey was in hospital in May she also went doolally. I think that (in her own little cat way) she pines for her ‘daddy’. She takes to nipping me when he isn’t here, and she curls up on the rug where his feet should be. She sleeps with me on the bed, perhaps to make sure I don’t bugger off and leave her too! Bless her. He’s ok, by the way. Well, he’s obviously not or they wouldn’t be a) keeping him in, and b) moving him to a hospital with a specialist kidley team, but he’s mentally fine. Bored, but fine. I am a rubbish friend. I am a reallyreallyreally rubbish friend. ‘Scuse me whilst I ponder the many reasons. I am the jealous friend who perversely stores up insane amounts of GreenEyedRage. Why are you doing that for him, but won’t do this for me? I secretly sigh. I am easily bored by people. I find fault with someone and spend too much time dwelling on the fault, until the friend gradually falls from grace. I have this awful habit of finding myself superior to others despite knowing I’m inferior. This causes friction in my head and makes me grumble silently. I think that really I just tend to give up on other folk far too easily. And I actually think I’m just reallyreallyreally rubbish at keeping the friends that I do make. I just find it difficult to get too close to people and tend to push them away, subtly. If you’re not too close to someone then you can’t worry about them, or care so much that it hurts. And vicky-verka. Also, I don’t think I actually understand why people might like me. I find it odd. The Blokey is back in hospital. I’d like to curl up under a stone and sleep till 2009 (which will surely be a more agreeable year,) but I’m too big and I’m not an animal. On Monday evening we toddled off to the Quaint Historic Market Town where we used to live. We ate good food and drank fine wine in a lovely little restaurant. I wore my pearl necklace for only the second time (it’s been sitting on top of the wardrobe, tucked up safely in a posh box which has been gathering copious amounts of dusty-ness; I’d forgotten how small and dainty and sweet it is) and got quite giggly. We were undercharged for drinks, but *ssshhh*. We did this because it was our second wedding anniversary yesterday. Would you have married me if we’d already known about these illnesses? He’s a daft plonker sometimes. He breaks my heart and makes me laugh, all at the same time. But I’m leaving him this weekend … he’ll have to fend for himself and remember to take his thriftyseventyeighth million pills twice a day. Or perhaps I shall prod him with a gentle text, or two. If you were to pick him and shake him he would probably sound like a baby rattle. I would rather he sounded like a money box, but there you go. So, we toddled off to the hospital. The consultant threw a lot of questions in his direction, the nurse took three vials of blood (he’s given so much blood over the last twelve months it’s a wonder he has any left), and we were asked to wait in the waiting room for the results. Those pesky lab folk weren’t on the ball and we had to sit and wait for three hours. Tsk. It wasn’t too bad. I got to do a lot of people watching, which I love. It wasn’t like ER or Casualty though; there was very little drama or excitement. The Blokey admitted that in the past he’s kept things from me, bad things. You worry too much. I don’t want you to worry, he said. It doesn’t matter. I worry too much anyway. But I love him for thinking that by not telling me things he’s making my worry issues less! He’s a banana. Today The Blokey probably sounds like a louder baby rattle. I will spend the rest of my married days (which could quite easily be the rest of my life) worrying about my husband. I don’t mind this. I do mind watching him suffer, and I do feel his emotional pain as he keeps getting smacked down just as he feels he’s making progress. It’s horrid. Of course, there is a positive to all this. The Blokey gets free prescriptions because of another medical issue he has … he’s the chap in front of you at the pharmacy who just has to wave an exemption card around whilst you have to pay £7.10 per prescription. Sorry about that. Sometimes I feel as though there are too few hours in the day. But when I look at the clock it says it’s four o’clock and my mind instantly thinks, I’d be leaving work now! I’m not ready to fall back into my routine! Where’s my day gone?! I would like Wednesday’s to last a few hours longer than other weekdays. That would make my world perfect. Work has been odd since we went back after the summer holidays. People thrust things upon me and then have meetings where they mention how wonderful I am because I get things done, beautifully and efficiently. They buy me chocolate. Other people make me exasperated with their silly little ridiculous goings-on. It’s like being at school again sometimes. I think working with teenagers rubs off on some folk, till they forget that they’re adults. But everybody forgets that I want to actually work with the students … my timetable is lacking (I only have three kids, once a week each) and it’s frustrating me. They can’t afford to frustrate me … if I leave they’ll be buggered because there will be no wonderful person who does things beautifully and efficiently. I am not arrogant. I am just good at my job. But even being good is not always enough.